DRAMAtical Murder (ドラマティカル マーダー, Doramatikaru Mādā?) is a Japanese BL visual novel developed and published by Nitro+CHiRAL. The plot focuses on Aoba Seragaki as a mystery in his once peaceful life unfolds. As he gets caught up in violent street games and meets a series of mysterious men, Aoba slowly discovers the truth behind the war developing around him and his own existence. 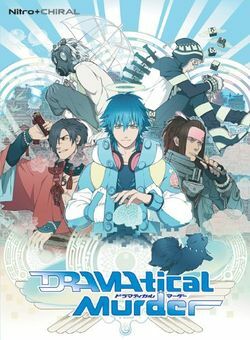 A follow-up to Nitro+CHiRAL's hit Togainu no Chi, DRAMAtical Murder has experienced a similar degree of success with the release of a manga series, anime adaptation, and even a sequel. An English patch is also available here. In Midorijima, a plentiful island to the southwest of the Japanese islands, mankind and nature once coexisted. However, due to being purchased by "Tōue Company," a powerful corporation in Japan, one-third of the island has been changed into an extravagant amusement facility called "Platinum Jail". Equipped with the latest cutting-edge technology, Platinum Jail has gathered attention. On the other side, the islanders who became victims of forceful development are forced into the "Former Residents District", and have no choice but to carry out their lives in a place that is by no means prosperous. The protagonist Aoba Seragaki spends his days working part-time at a junk shop named "Heibon," inside the Former Residents District, living with his grandmother Tae. Among the youth of the Former Residents District, a certain game has become popular. In "Ribstiez," teams are created and days of human-bullet turf wars unfold. On the other hand, "Rhyme" is an electronic brain online game using a virtual world as its setting. Aoba shows no interest in either game, thinking that it would be nice to just live peacefully with his grandmother. But naturally, a disaster is bound to shake up those peaceful days. This page was last edited on 5 June 2014, at 23:39.